Every penny received goes to fund our animal welfare projects at IDA(In Defense of Animals). Your support is vital to IDA’s efforts to protect the rights, welfare and habitats of animals. 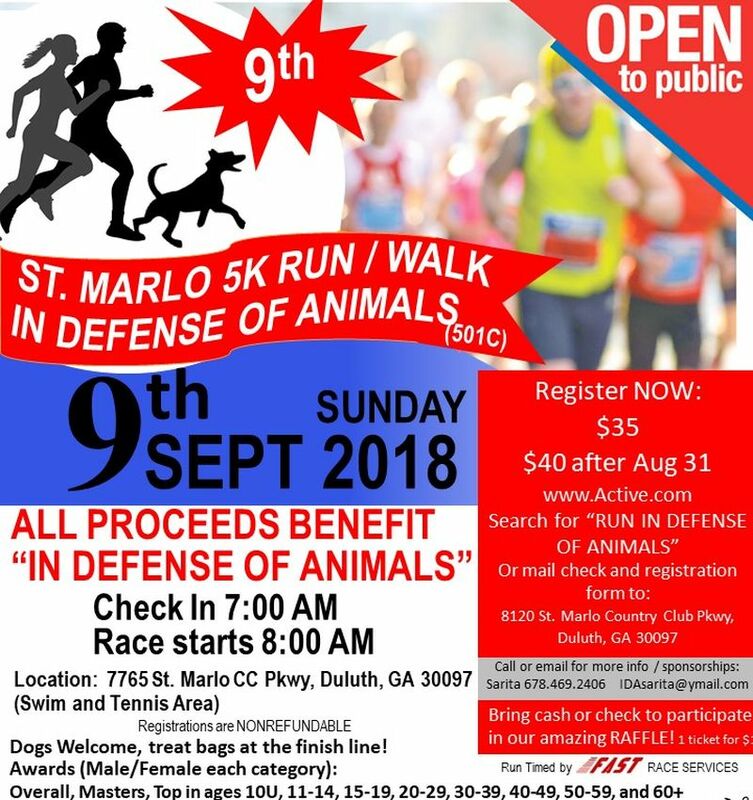 Our 9th annual “Run/Walk IN DEFENSE OF ANIMALS” - 5K is on 9th Sept’18 (Sun) in St. Marlo Country Club, Duluth, GA 30097.
or just fill out the form in the attached flyer and mail it with your check. Instructions/ info is in the form itself. You can choose to either Run the 5K or Walk. Report @ 7 am on the Event day. Race and Walk starts at 8 am sharp. Awards: Overall M/F, Masters M/F, Top M/F in 10 and under, 11-14, 15-19, 20-29, 30-39, 40-49, 50-59, 60 & up. Only participants that register by 31st Aug are guaranteed their size of T-shirt. Rest will get a Large size T-shirt until stocks last. Well-behaved pets/dogs on leash are welcome and can participate for free! There will be water available in bowls for them & treats too! We will have an interesting Raffle with beautiful paintings and other items. Please remember to bring cash or check. $ 1 for 1 ticket, $ 5 for 6 tickets and $ 10 for 12 tickets.